Day 1 – Day 8 The Run has Started. Hentie’s Bay. We found a campsite which had showers and a little kitchen area. We parked up and the team put up the tent. In the afternoon I decided I wanted to start and after being in the truck for four days I thought it was a sensible decision to ease into the run. So at 5pm I ran into the Atlantic Ocean and reality sunk in, this was the start of our run across Africa! I’d been surprisingly relaxed about this run hoping I’ve got the training mixed with the experience to get this right. There will be many obstacles that I will have to overcome but I’ve learnt over the years all you can do is give it your best shot. As I run out of the sea which was bloody cold and extremely rough I was happy to have finally made a start. I didn’t want to go too deep as I thought there may be sharks there. I passed through the small town of Hentie’s Bay, crossed the junction and into the desert. Flat, sandy and a bit like a scene from Star Wars. In some ways it felt like the end of the world which was strange because this was the start! With silence around except for my squeaking trainers I’d ran the first 6 miles. Yay I’ve made a start! High five with Libby who’s cycling alongside me carrying my water and being a fantastic support. Day 1 is done. Back to the camp where the team have cooked our dinner of spicy pasta. 1st camp site – setting up camp. I slept extremely well and was surprised how cold it was in the morning. We set off to the marker to restart from where we’d finished last night. With my head torch on and music playing (I always listen to music – often DJ sets from my clubbing days). The support vehicle slowly driving behind us it felt very eerie. A light breeze in my face and my feet adjusting to the sand. We were greeted with the most beautiful sunrise but with that came the heat. By 9am it was 30 degrees and the light revealed a long empty sandy road ahead. Nothing apart from a few sparse shrubs. The sun was beaming down on me and I was conscious of keeping as much skin as I could covered while putting suncream on my legs. I decided to pull my buff up over my face and wear my jacket back to front protecting my arms. We stupidly didn’t pack much water, my fault and from mile 13 I would stop to shield myself with the truck from the strong winds. Running on sand with a headwind blowing sand toward you and the hot sun makes for extremely difficult running conditions. A little disappointed but I decided to stop the run at 19 miles. Day two is complete. In the afternoon we drove up to Cape Cross to see one of the worlds largest seal colonies. An unbelievable sight of thousands of seals led across the beach while many bobbing along in the water. The noise was immense, sounding something like a goat and a screaming child. The smell was pretty disgusting too. But their cute faces made the noises and the smell seem fine. Waking again to start at 6.30am I was determined to run further today. We set off at 6.30am in the darkness, Libby having her pepper spray close to hand as we were unsure what animals were around. Day 3 would turn out to be the hardest run I’ve ever experienced. The conditions – sand, headwind, temperature – it felt like I was running either on the spot or backwards. Mentally it was extremely difficult but I tried to stay positive and upbeat. In my head I kept thinking one foot in front of the other, this will make me stronger in the long run. We literally are in the middle of nowhere, no villages, no people, no vegetation, just the desert and no Jar Jar Binks (Star Wars)! We camped at the side of the dirt track with the tent feeling like it was going to blow away we all tried to relax in the shade. I went to bed with a sense of achievement as in those conditions I ran 25 miles which was great for my confidence. We all stood in silence looking up at the stars, it felt like you were in an oval globe (those glass ones you shake and snow flies around). This is the start of an exciting adventure. Finally as the sun rose another fantastic start to the day there were some trees. A relief after three days of just desert. After yesterday’s struggle in the wind I felt strong and relaxed, my legs had finally realised what they should be doing rather than feeling a little heavy as they had the first few days. I was joined by Manuel today which gave me a boost to have some company. It’s important the first few weeks to get the balance between running alone and having company as mentally it’s a big task. Another night wild camping, nshima and veg for dinner. The team are getting into a routine of going to bed at 8pm ready for a 6.30am start. With the usual start time of 6.30am the landscape started to change with mountains in the distance and trees and shrubs either side. The landscape was breathtaking. It was like we were the only people for miles and you realise away from social media (no network) and tv that living in the moment without distractions instead fully appreciating our environment we should do more often. Antonia and Steve would usually leave us once it was light to go ahead and find a suitable place to camp. Our spot for camping this evening was idyllic surrounded by mountains and a large rock we could scramble up and look out in 360 degrees across the African plains. However we did notice several holes and several dead centipede shells. Another 25 miles run taking the total to 100 miles. Another beautiful sunrise as we approach the gates of a game reserve. As we enter the gates our adrenaline kicks in after the gate man replies ‘yes in here we have cheetah, lions, rhinos and leopard.’ This has to be the most exciting day so far Libby holding on to her pepper spray we’re joined by Manuel and Peter drives the truck closely behind us. Baboons cross the road ahead of us and antelope run further into the trees as we pass by. Towering above the trees I see my first wild giraffe. It’s an unbelievable experience running through wildlife. I’m starting to feel fully relaxed my legs feel great and mentally I feel extremely focused. Tonight we camp up in the mountains, finally a hot shower and views that seem to go on for miles. Manuel and Gostar find a small snake which everyone is very relaxed about until later on when we realise it was a puff adder. The morning session I ran 20 miles, in the evening after the midday sun I went out and ran another 8 taking today’s total to 28 miles. My strongest run yet. We all set off early and had 12 miles left in the game reserve seeing more antelope and warthogs trotting across the road make me feel I have to pinch myself that this is really happening. The first seven days the terrain has been quite difficult underfoot – sandy, stones and uneven, but I think its good for my joints as it’s lower impact than road. We reached Omaruru and spent the afternoon at a Meerkat Café (no meerkats) we stayed there several hours charging our phones, enjoying coffee and tasty food. We finally reach a monastery where they offer us rooms for a small donation, another bed and a kitchen to cook in. Rice and veg for dinner and another early night. They kindly gave us eggs as a gift. The coldest start yet, 5.30am first obstacle – we’re locked in the monastery! I finally find a man with a key who was half asleep but let us out. The day started slow, I seemed to struggle the first 6 miles because all I could see was a long long long road ahead. It was a little unnerving as we saw more paw prints on the track we were running along. The day was split again into a 20 mile morning run followed by an 8 mile evening run. We camped up at the side of the road, as we were all relaxing a truck pulled up and a rather angry man approached us. He was the landowner, once we had explained what we were doing he seemed relaxed and suggested we speak to someone nearby next time. Quite difficult when you don’t see anyone for miles! Another early night, we were surrounded by jackals screaming and a mix of other animal/bird noises. This didn’t make you want to go outside so instead I peed in a pot and threw it outside. A great night’s sleep despite the early noises. 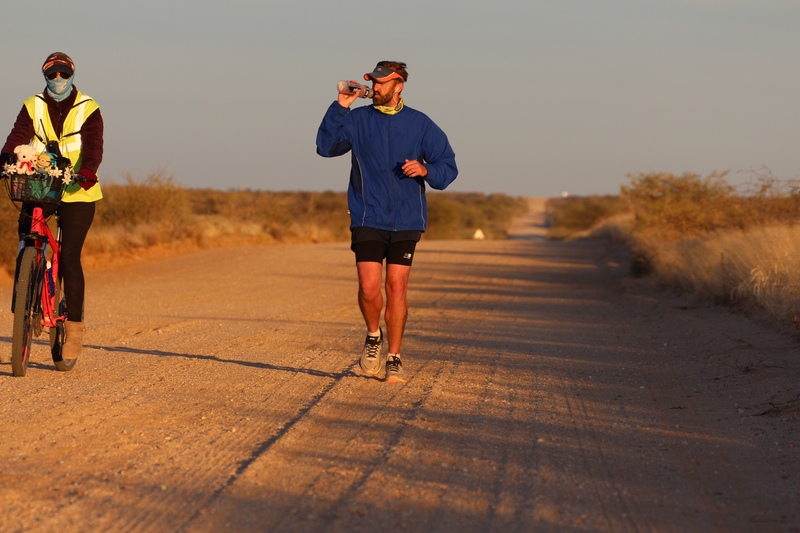 ← Running Africa Coast to Coast 2,500 miles. – The Journey to the start line.